Realistically, the top four picks of Andrew Wiggins, Jabari Parker, Joel Embiid and Dante Exum will be off the board by the time the Lakers’ pick rolls around. But the good thing is that this year’s draft is one of the deepest we’ve seen in years. That means the Lakers will evaluate multiple players before the draft on June 26. With only three players under contract (Robert Sacre, Kobe Bryant and Steve Nash), whoever the front office decides to select at No. 7 will likely be plugged into the starting lineup right away. The seventh pick may not give them one of the top three elite talents in the draft, but it’s a chance the squad can land a future All-Star. After finishing the 2013-14 NBA season with the sixth-worst record in the league and the most losses in franchise history (55), the Los Angeles Lakers earned a spot in the NBA Draft lottery for the first time since 2005 when they selected former center Andrew Bynum with the 10th overall pick. Coming into the lottery, the Lakers had a 21.5 percent overall chance of grabbing picks 1-3. To break it down even further, the Lakers had a 6.3 percent chance at the No. 1 pick, a 7.1 percent chance of moving up to the second spot and a 8.1 percent chance of getting the No. 3 pick. 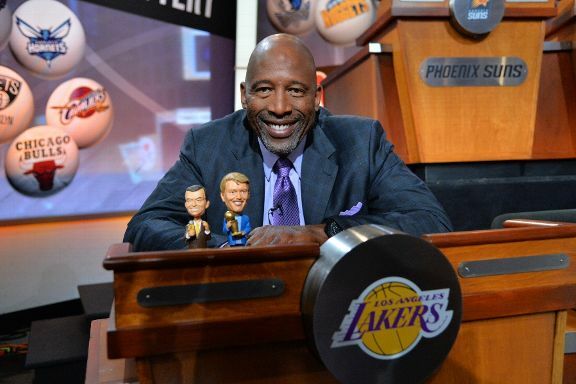 James Worthy even brought his lucky charms — bobbleheads of Chick Hearn, Dr. Jerry Buss and Bill Sharman. But even they couldn’t work their magic. The Lakers slipped to the No. 7 pick, instantly losing out on prospects like Joel Embiid (Kansas), Andrew Wiggins (Kansas) and Jabari Parker (Duke), who all could possibly make an immediate impact.